2645 S Liddesdale Street Detroit, MI. | MLS# 219024128 | The premier resource for all real estate information and services in Metro Detroit. 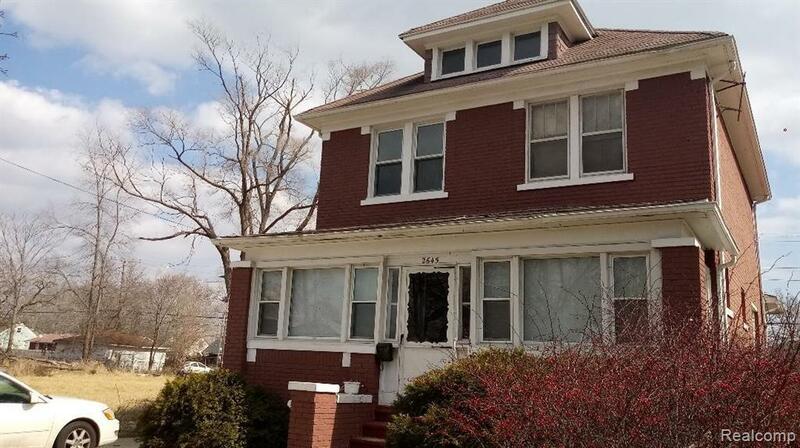 LARGE TRUE 5 BEDROOM BRICK HOME WITH EXTRA BACK ROOM (22' X 8'), FOR 1 or 2 EXTRA ROOMS OFF THE KITCHEN PLENTY OF LIVING SPACE & ROOM FOR LARGE FAMILY OR GROUP HOME ETC. FEATURES 1ST FLOOR BEDROOM, DINING ROOM, SPACIOUS KITCHEN, 4 BEDROOMS UPSTAIRS, STAIRCASE TO ATTIC WITH PLENTY OF HEADROOM FOR 3RD FLOOR EXTENSION OR STORAGE. FULL BASEMENT WITH EXTRA FINISHED ROOM, FULL BATH & LARGER GLASS BLOCK WINDOWS FOR DAYLIGHT, SOME NEWER PLUMBING. A VERY SOLID, LARGE FAMILY HOME. **WALKING DISTANCE TO NEW KEMENY RECREATION CENTER WITH LIBRARY, TUTORING, 2 GYMS, INDOOR & OUTDOOR ACTIVITIES AND LEAGUES FOR ALL AGES. ALSO MINUTES FROM DOWNTOWN DETROIT ACTIVITIES AND DOWNRIVER COMMUNITIES.